Passionate Monkey - will make you climb the nearest coconut tree. Waikiki Volcano - not a sissy drink. Monsoon - sorry, limit of 3 to a customer. Fog cutter - delicious but devastating. 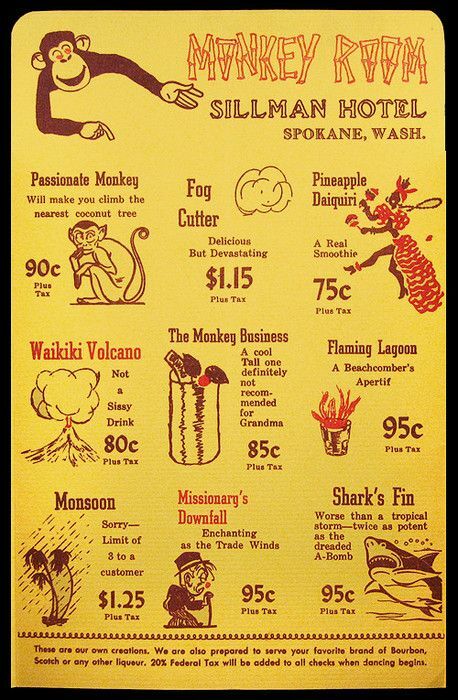 The Monkey Business - a cool tall one definitely not recommended for Grandma. Missionary's Downfall - enchanting the Trade Winds. Pineapple Daiquiri - a real smoothie. Flaming Lagoon - a beachcomber's aperitif. Shark's Finn - worse than a tropical storm - twice as potent as the dreaded A-Bomb. These are our own creations. We are also prepared to serve your favorite brand of Bourbon, Scotch or any other liqueur. 20% Federal Tax will be added to all checks when dancing begins. Coolie Cooler - a Pick Me Up after a Rickshaw ride. Scorpion. Beachcomber's Delight. 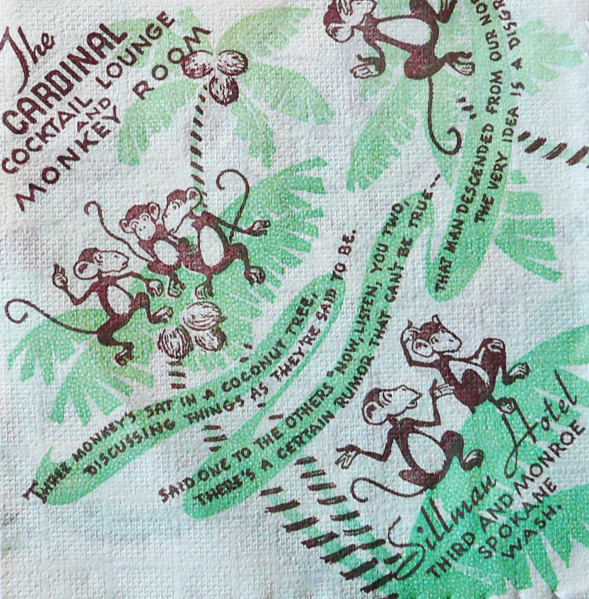 The Cardinal Cocktail Lounge and Monkey Room. Three monkeys sat in a coconut tree, discussing things as they're said to be. Said one to the others, "Now, listen you two, there's a certain rumor that can't be true - that man descended from our noble race, the very idea is a disgrace." 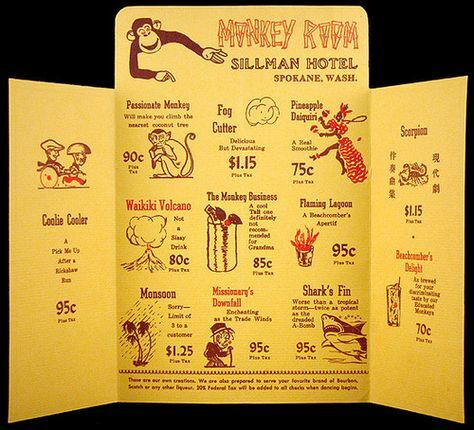 Sillman Hotel, Third and Monroe, Spokane, WA.